“Reports have reached me, which I fear are correct, that President Harding has gone. The world has lost a great and good man. I mourn his loss. He was my chief and my friend. “It will be my privilege to carry out the policies which he has begun for the service of the American people and for me to meet their responsibilities whenever they may arise. “For this purpose I shall seek the cooperation of all those who have been associated with the President during his term of office. Those who have given their efforts to assist him, I wish to remain in office, that they may assist me. I have faith that God will direct the destinies of our nation. These words, delivered on the announcement that the President had died thereby leaving Calvin Coolidge to succeed him on August 3, 1923, underscore the profound importance of our institutions as constituted. Coolidge’s oath by his own father, a local notary, could not have made the point any clearer. This is our nation and our government. We make it work for us. America is unique for so simple and orderly a process of succession but it is also profoundly grieved when it loses good leaders. The path blazed by Harding would continue under Coolidge. That simple expression of continuity, respecting our will at the ballot box, comforted a nation that genuinely and rightly missed a President who had lit the way back toward our American ideals of self-reliance, understanding and independence. 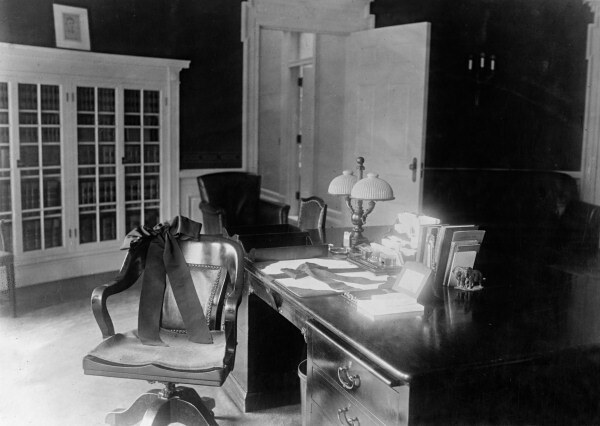 This is a scene from the Oval Office with the President’s chair in mourning ribbons in observance of President Harding’s death, 1923.